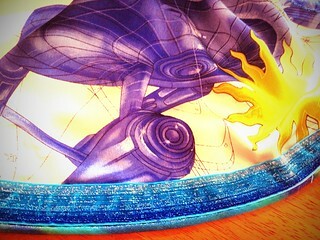 Amazing sewing extraordinaire, Amber Snommis, is at it again. She just finished this incredible project, which I am happy to share with you. Make sure to track all her work and how-to articles on Miss Parayim. It’s been a month since my last completed project post, but I’ve been busy! 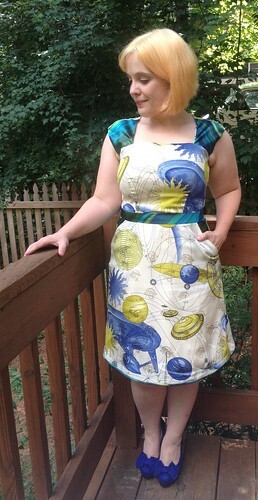 I’ve been working away at my version of the Sewaholic Cambie dress. I decided a while back that the a-line version without the sweetheart neckline (thanks to the handy dandy tutorial on Tasia’s blog) would be perfect for my favorite fabric. I finished the dress over a week ago- just in time to debut it at the super awesome fun time that was Play On Con. So, while I usually have tried to post my projects within a day or 2 of completion, I am doing this a little late because I had a lot of sleep to catch up on. I love the shape of this dress. The A line has a little bit of a late 1960′s feel, but is not so obviously retro. I like that there is a little flare still in the skirt. It doesn’t feel as sultry bombshell as a straight or pencil skirt, but it’s much more tailored than a fuller gathered or pleated skirt, and I only had about 2 yards of the fabric, so I wouldn’t have had enough for that anyway. I think it’s a good balance between the two, and just right for showcasing a large scale, busy print. The main fabric is silk, and is probably the softest, floatiest fabric I have worked with so far. I’m glad I did some test stitches on scraps because I very quickly discovered my feed dogs were hungry, and they think silk is delicious! To avoid disaster, I pinned a strip of tissue paper to the feed dog side of every seam before I sewed it. It was a pain, but it worked. I also reduced my stitch length to 1.6 (my machine default is 2.5). I thought puckers might be an issue, but that was fine. I noticed in my test scrap that the seams with a longer stitch length were pulling at the fabric, and I could see the holes where needle and thread had gone. 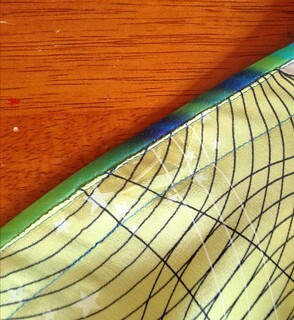 Shortening the stitch length helped prevent this from happening, and kept the seam together and strong. I tried to be soooo careful in laying out this pattern. I even made myself a chart of each piece of the garment, and where the enterprise would wind up- left or right, top or bottom. But I must have had the pattern piece for the skirt back wrong side up when I went to cut it because I ended up with 2 enterprises on the same side in the back. Oops! It doesn’t bother me too much- especially since I don’t look at my own back, but I was kind of annoyed when I discovered the mistake. The back of this dress ended up being a little bit tight, but nothing some spanx couldn’t make better. I’m not exactly sure why that happened. I muslined the dress 3 times, and it seemed like it would be OK, but I wound up having to take it in at the neckline, and maybe I got a little over eager at that point. Or maybe the zipper in my muslins wasn’t placed well. Or maybe I gained 5 lbs in between starting and finishing this dress. Who knows. I really like the pattern, and I’m not too disappointed with the fit, but I will definitely be re-mulslining it if/when I make it again, and will probably add a side dart and a real FBA instead of only monkeying with the back and side seams, which is what I did here. I lined the dress in a quilting cotton I found at Jo-Ann. I didn’t plan to line it in quilting cotton, but when I saw the print, how could I not? I wanted something breathable since I’d be wearing this at “Nerd Camp”, and while a lawn or voile would have probably been softer and more drapey, the cotton did the job of ensuring against transparency, keeping me from sweating, and providing some support to the bodice. Also- ENTERPRISE! 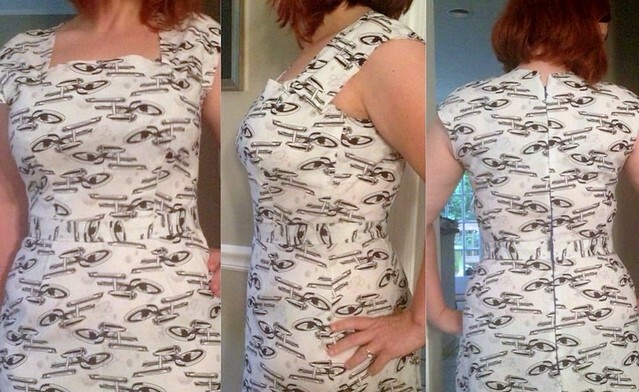 You can see in the final muslin/lining fit photo there’s some gaping around the neck area. I thought this might be self correcting once I attached it to the silk, and wasn’t looking at seam allowances, but no such luck. Doing the fix at that point in the project was definitely not ideal, and another reason for a new muslin next time. I finished off the hem with piping I’d made from leftovers of the sleeve and pocket fabric, and I covered up the ugly with this sparkly blue trim. I’m a sucker for the sparkly. I look for excuses to work it in. That contrast fabric has a little bit too. I originally thought about using the piping around the neckline, to make a clean, sharp, seam with that floaty silk, but it was suggested I understitch it instead, and that worked just fine. I’m glad I didn’t use the piping there because it does add a little bulk, and I made sure I packed my trusty iron for the con to de-wonk the hem before heading out, and that helped. Sewing the dress was a good experience. I sewed a fabric I had never worked with before, and while it isn’t perfect, I don’t regret it. I feel like I learn something new with every project, and this was definitely no exception! I didn’t even get into the genius way the invisible zip is installed, but I know I’ll be using that technique in the future. I really like the pattern, and I think I will definitely make it again!